On Thursday, July 18th through Saturday the 20th, it's time to channel your inner Moondoggie and Gidget for this unparalleled surf event, the Surfalorus Film Festival. A full daily roster of short and feature films will be shown at outdoor venues in Carolina Beach, historic downtown, and Wrightsville Beach. The films will feature their fair share of ripping and shredding plus a range of topics, including conservation, coastal preservation, and surfing lifestyles around the globe. In addition to the films, there will be a variety of other activities, music and the Board and Beach Expo at Tidal Creek on Saturday. The festivities kick off on Thursday evening at Carolina Beach's Ocean Grill and Tiki Bar. The band starts at 6:30 pm, followed by fireworks at 9 pm and 2 films at 9:30 pm. On Friday morning, get your sesh in early so you can head to Red Dogs at Wrightsville Beach for an unforgettable day of surf films. The first screening starts at 10 am with a collection of 9 short films wrapping up just after 7 pm. Later in the evening, at 8 pm, the party moves to Jengo's Playhouse downtown, where there will be live music and 2 more films. Don't stay out too late because the fun intensifies on Saturday morning at Tidal Creek Co-op. There will be activities for the whole family, beginning at 10 am. 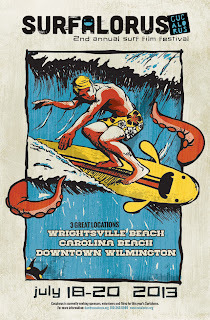 Get there early to try "Surfer's Yoga" from the Wilmington Yoga Center, watch a demo by local surfboard shapers, sample microbrews, visit surf vendors, and take part in a coastal cooking workshop with local chef, James Bain. If you're worried about the July heat - don't sweat it - just cool off with a ride down the All-Day Slip-N-Slide! The final leg of Surfalorus wraps up at Jengo's Playhouse. Films will run from 5 pm until-culminating with the Surfalorus Night Cap-a showing of vintage surf classics at 11 pm. Get your tickets and plan your strategy now! As with any film festival, it is advised to read about what is showing, when and where, so you won't miss anything on your personal "must-see" list.